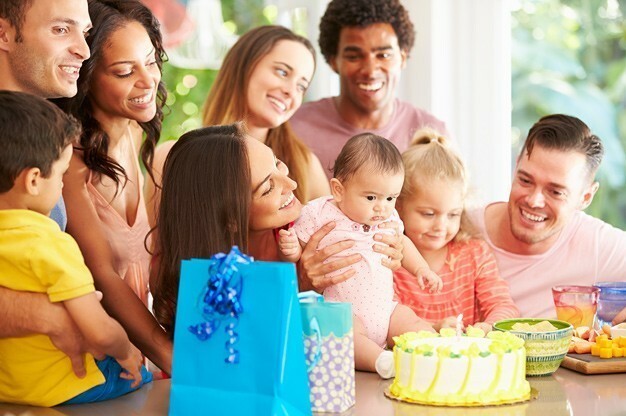 We can imagine the excitement of planning a 1st birthday party for your little bundle of joy… and you are likely to be inviting plenty of guests including children of all ages. With our entertainment guide here on www.EntertainersWorldwide.com you can keep things stress-free and children suitably entertained to make sure that your party goes smoothly! Many children love clowns and they are very versatile as they can entertain young children from toddlers up to Primary school age. Clowns offer variety when it comes to entertainment and some will perform balloon modelling, play games with children and annoy the grown-ups too! 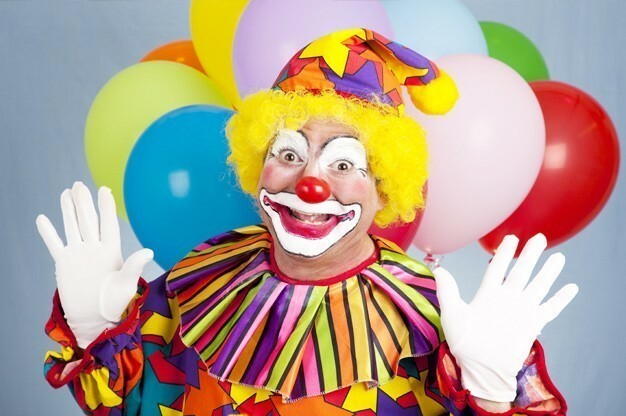 A clown can easily be booked for a number of hours to prevent younger children from getting bored, leaving you to continue with managing the party and showing off the birthday boy or girl! Click here to find a clown near you for your child’s 1st birthday party! One of the benefits of hiring a children’s magician is that they will entertain children of all ages, including teenagers. A children’s magician will amaze and astonish your little guests by performing magic tricks using balls and other objects and will also generally play games too. Some children’s magicians will offer workshops to teach older children how to perform simple magic tricks which can be very useful if you have budding magicians in the family! 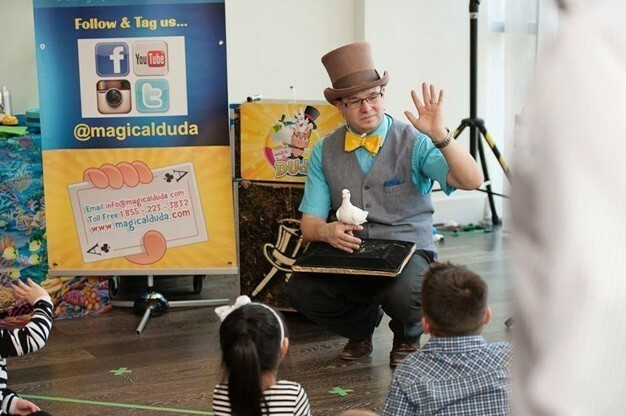 Want to find a children’s magician today? Click here to view all of our listings! Another fantastic entertainment idea for younger children is to hire a face painter who will turn young children into their favourite animal, super hero or princess! We wouldn’t recommend this type of entertainment for very young children, but toddlers and primary school aged kids absolutely love playing dress up! A face painter will sit in one location for a number of hours while they transform all of your little guests. Since only one child can be face painted at any one time, we always suggest adding more entertainment for children as they wait. Book bubble performers for something a little quirky! Every child loves bubbles and now you can get much more advanced bubble play than that of a little pot and stick to make your own! 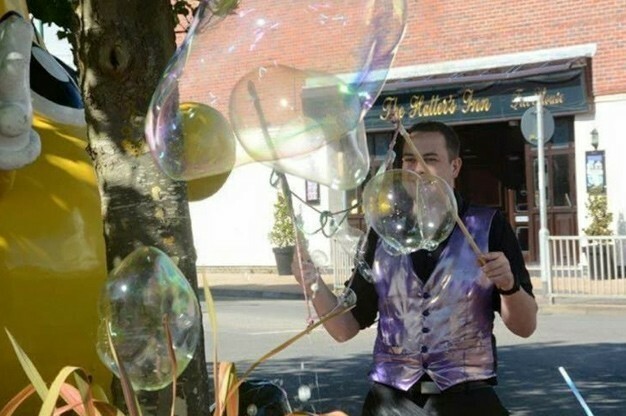 Bubble performers will perform tricks with bubbles including making giant bubbles, putting people inside bubbles, making square bubbles and putting bubbles inside bubbles! Children will be amazed at the tricks that can be performed and will want to have a go too! Bring delight to children of all ages and book a bubble performer for your child’s 1st birthday party. Remember the old fashioned Punch and Judy shows by the sea as a child? Things have come a long way in puppeteering which is bringing it right back into fashion! Book a puppeteer to put on a play for the younger guests of the party which will add comedy, fun and an element of naughtiness! Many puppeteers have a number of puppets to work with, so get in touch with one today to see what they can offer your party! Our website, www.EntertainersWorldwide.com should be the first port of call if you need entertainment for any event and we make it really simple to get in touch with any of our listed performers. We are one of the only entertainment directories that doesn’t act as an agency – this means there are no hidden fees or additions to your booking fee. Our service is completely free to use, so start browsing through all of the entertainment categories to view each entertainers profile, view videos and read previous customers testimonials. This entry was posted in Birthday Party Entertainment Ideas!, Which Type of Entertainment Should you Hire?. Bookmark the permalink.